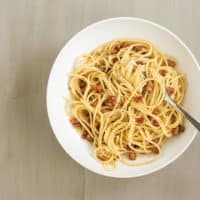 Classic Spaghetti Carbonara | Good. Food. Stories. 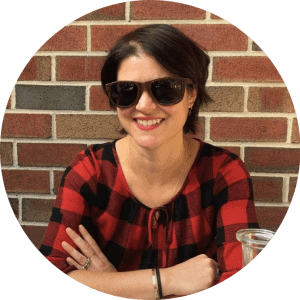 When I get together with new friends or am thrown into a group dinner with those I don’t know well yet, I always have a few questions in my arsenal of party tricks to keep conversations going and to draw hesitant introverts out of their shells a bit. Shockingly (I know), pretty much all of these revolve around food. “Cheese or chocolate?” is always a good debate starter, but if you really want to get someone talking, ask them what their desert island meal would be. Mine, for example, would be spaghetti carbonara. This time-tested recipe was the first post out of the gate here at Good. Food. Stories. way back in its inception in 2009, and nothing about it has been improved since—it’s impossible to make it any more perfect, and believe me, I’ve tried. This is exactly the way I want my spaghetti carbonara to be. In fact, I’m so specific about my carbonara that I’m inevitably disappointed by the way it’s served in most restaurants (for the record, both Prune and Maialino in New York do it almost exactly like this, should you want someone else to prepare it for you). I’d rather do it myself and do it right, and when it takes barely no time at all to get a big bowl of perfection in front of you, why bother going out at all? Spaghetti carbonara cures all ills on bad days and is a highly appropriate celebratory splurge on good ones. It is, as the kids say, everything. It’s at once luxurious and so simple that it’s pretty much a ratio in and of itself, yet it impresses everyone I serve it to. Make it for one person when you need a pick-me-up, make it for two people when you want to thank your husband for tiling the basement steps without your help, make it for four when you want to thank your husband, your dad-in-law, and your uncle-in-law for rewiring the basement and foyer lighting without your help. Everyone wins with spaghetti carbonara. 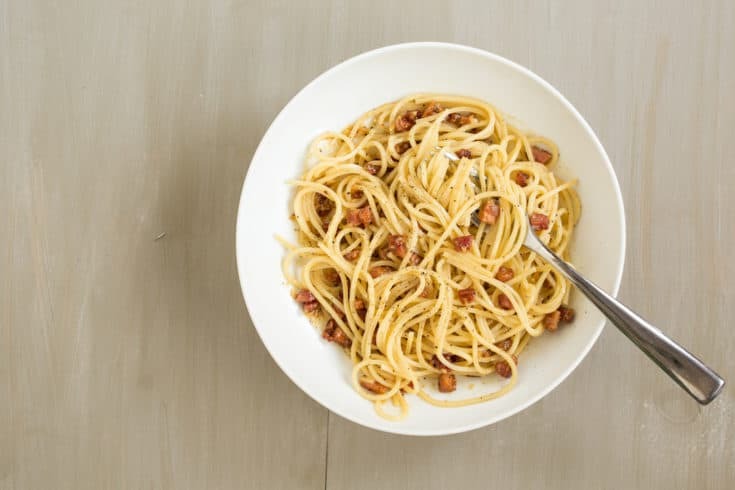 Spaghetti carbonara, with eggs, black pepper, pancetta, and Parmesan cheese, is one of the easiest and most satisfying pasta dishes around. No cream! As the water heats, find a wide-bottomed bowl for tossing and serving the pasta; it should have a lot of surface area. 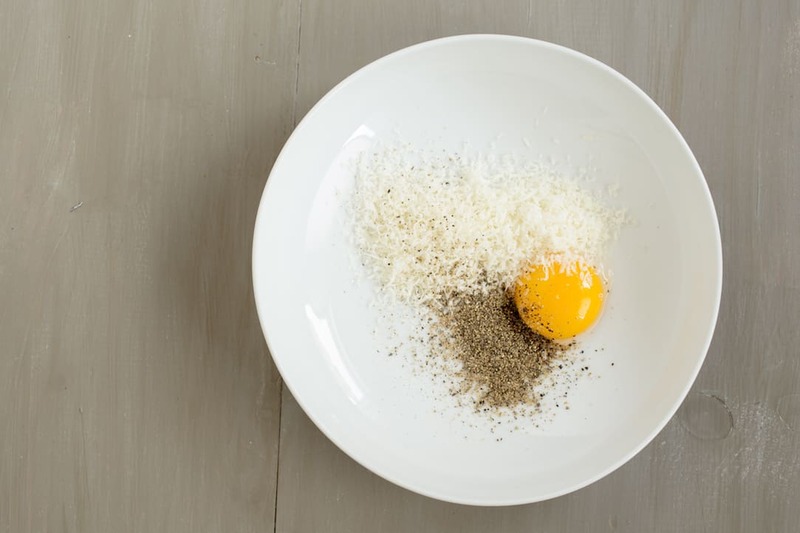 Whisk the egg yolk, Parmesan, and black pepper together in the bowl with a fork to make a thickish paste. Set aside. 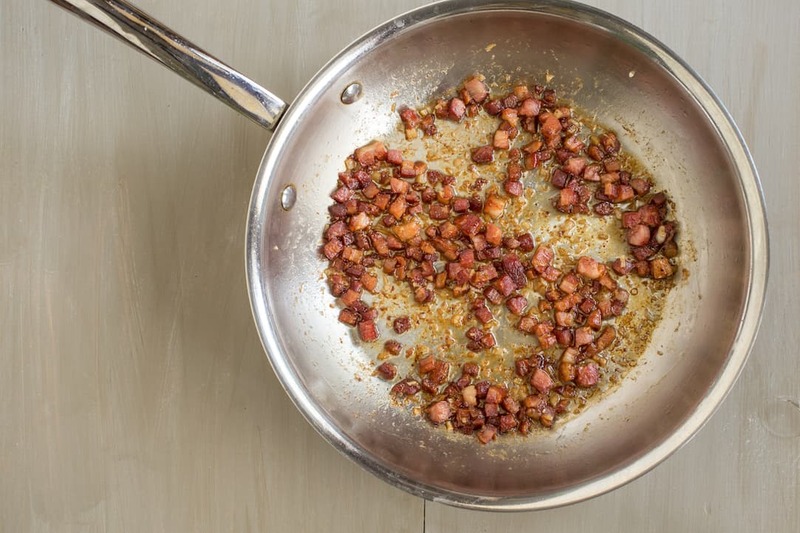 Cook the pancetta or guanciale in a skillet over medium-low heat until the fat is rendered and the pieces are crisp, about 5-7 minutes. When the cubes are well-browned, stir in the garlic and cook for a minute to mingle the flavors. Add just a splash of wine to the pan, a little less than a shot glass’ worth. Stir to deglaze, getting all those good browned bits off the bottom and into the sauce. Remove from the heat. When the water comes to a boil, add 1 tablespoon kosher salt to the pot, then stir in the spaghetti with tongs. While the spaghetti cooks, add the cooled pancetta and its sauce to the egg and cheese mixture in the serving bowl. When the pasta is al dente, use the tongs to transfer the spaghetti directly from the pot into the serving dish; the pasta needs to be piping hot and a little drippy with its cooking water. Mix and toss with the tongs, adding extra pasta water as needed to meld everything into a luscious coating for the strands. Taste for seasoning before eating; the dish might need a little salt but the Parmesan and pancetta usually take care of the saltiness factor on their own. Also note that this makes outstanding breakfast leftovers, should you manage not to eat the entire bowl in one sitting.